The Moment summer 2016 intern group worked closely with educators and students to create a Mixed Reality learning experience for students. 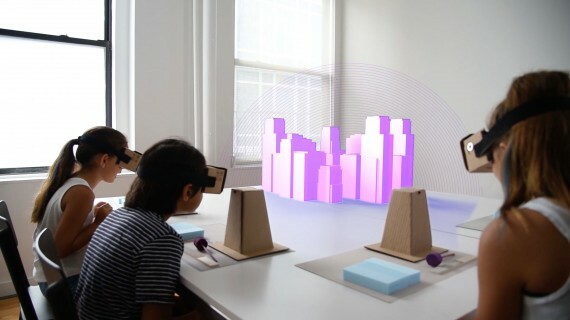 Peer is a Mixed Reality platform that uses a combination of physical and digital elements to engage students by making abstract concepts and complex forces visible and tangible. Traditional education relies on textbooks, videos, memorization, testing, and instruction in order to teach students about “hard to see” and “invisible” science topics. Although this method of teaching was successful in the past, new teaching methods like S.T.E.A.M. and maker education are making impact in the classroom by changing the way students learn—by doing. Through our research we found that there were three key aspects that we should keep in mind when teaching complex problems: providing context, facilitating prototyping, and opening collaboration. Providing context allows students to understand not only whey they are learning a particular topic, but also understand where this topic fits into the real world in the future. Prototyping encourages students to iterate over their designs at a rapid pace so that they can innovate at a quicker rate. By opening collaboration, the classroom is a space to work together and build off of one another through leadership and communication. By using a combination of Internet enabled sensors and digital headsets, Peer has the unique advantage of collecting real world data and displaying it to the student in a delightful way through Mixed Reality. Using Mixed Reality allows Peer to have the flexibility of combining the physical and digital in one seamless experience. For example, if a student were to change their blade angle slightly, the sensor would collect that and the digital feedback that is presented to the student would change accordingly.